It is perhaps a happy co-incidence that the history of the Castletroy Golf Club and Transatlantic Aviation began together in this Shannonside area at around the same time. Each in its own way grew and prospered, yet both maintained a close identity. 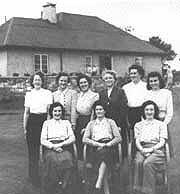 Some of the early pioneering airmen used the club facilities during their relaxing hours. In more recent times the crews who flew successive US Presidents to Ireland played golf over the course while their masters were otherwise engaged. While 1937 is the year of official foundation of Castletroy Golf Club, members of the adhoc committee played golf of a kind over the green pasture land in November 1936. It was in October of that year that the Limerick Harbour Board were called to Dublin by the Irish Government to announce the new Shannon Airport project. The following February the first flyingboat the “Cambria” touched down at Foynes and Dr Michael Roberts began his first of three terms as Captain of the Golf Club. Twelve years later Kevin Fay led a succession of players with associations at the Airport, who subsequently became Captains of Castletroy. The idea of setting up a second golf course so close to Limerick City was a surprise move, for at the time there were less than 300 members at Limerick Golf Club at the other side of the City. Even in January 1939 there were still only 239 men and 116 lady members at Ballyclough, where the entrance fee was £3 and the subscription was £4 annually. It all started early in 1936 when a group of men who felt they wanted another golfing outlet called a meeting at the Glentworth Hotel. Not more than a dozen attended and it was thought that the idea would have to be dropped because of a lack of capital and adequate potential membership. Another meeting was held and while the attendance was better there was little hope of raising the necessary finances to purchase land. Real hope arrived when local bacon factory owner Malcolm Shaw, (who later held the office of President of Castletroy on ten occasions), and his brother Captain Eric Shaw offered financial support. This lead was followed by others who later formed the first committee. The problem now was to find suitable land and as many of the advocates lived in or near Castleconnell at the time it was there they looked for the first site. An approach was made to a local farmer in Castleconnell who agreed to lease some land overlooking the falls of Doonass at a rent of £100 per annum. The layout was completed by Willie Daly, the late professional at Limerick Golf Club, but the proposition fell through. Lands at Ballycummin on the Cork road were also inspected. About this time Castletroy had become a fashionable residential area and some of the prime movers had settled there. Some of the Committee Members noticed a local farmer and his brother-in-law practicing golf shots on a section of land nearby. The Committee approached the farmer who agreed to lease enough ground for a nine hole course with an option to buy. Fifty-three acres of land were thus rented for £106 a year and the first nine holes were laid out. In February 1938, the club bought out the lease and acquired a further adjoining 38 acres, all for a total of £2,200. The course continued in this way as a 9-hole course until 1942, when a further 9 holes were added. All this time a working committee had been electe d, who were in fact the founding body. This committee remained in office for the first three years. Members joined quickly and initially there were between 60-70 who paid a subscription annually of £3. The Rules of the Club were drafted and considered at a meeting on March 3rd 1938, and that summer the course developed substantially. The first Clubhouse was a modest red galvanised iron shed built at a cost of £188, which remained in place until June 1964. Electricity in the early days was provided by a dynamo attached to a concrete mixer outside the Club House. The Club had a modest beginning in other ways too, as may be judged from the Balance Sheet of December 22nd, 1937. It listed the Clubhouse and Pavilion at £188.17s.0d, Debentures £350 received that year, and amongst the Clubs assets was a “Donkey and Harness, £6.12s.6d”. The latter was used for work on the course. Despite its inauspcious start, the club prospered during and after the Second World War, due to the hard work and dedication of its Officers and Members. Its reputation developed steadily as National Media attention began to focus more on the Sport, in particularly the Open Competitions. The Tirconnell Cup, which began in 1940 and the Scratch Cup which began in 1948 annually attracted the cream of players from all over the country. Eighty years on, we reflect on the founding days of the Club with nostalgia and pride and salute the men and women who’s dedication has contributed so much to the Clubs development. Many have distinguished themselves and the Club through their achievements in the sport both nationally and internationally. Others have contributed greatly to the development of the sport at Regional and National levels through their work in the GUI and ILGU Organizations. It is to memory of the early visionaries of Castletroy, and to all those dedicated Sportsmen and Women who worked hard over the years to build up the Club and its reputation that we dedicate this Website.